Welcome to the first day of Mayfairstivus! This holiday event lasting nine days celebrates Mayfair Games’ DC Heroes Role-Playing Game! From 1985-1993 this was one of the premier superhero role-playing games! A holiday event in December lasting nine days? Hmmm… Okay, you caught us. A few comic bloggers decided to use this year’s Hanukkah celebration as an excuse to post content from Mayfair’s long-running DC Heroes line. There will be a few different blogs participating, so check the links below for more Mayfairstivus activities (with apologies to the Costanza family). Many thanks go out to mastermind Frank Lee Delano (of the blogs: Martian Manhunter: Idol-Head of Diabolu, Justice League Detroit, Atom: Power of the Atom, Wonder Woman: Diana Prince, DC Bloodlines, and …nurgh…) for suggesting this celebration! Thanks, Frank! DC Comics helped support the DC Heroes game system with house ads in their comic books. Below you’ll find one of those early advertisements. DC was clearly pulling out all the stops with this ad, leaning on the popularity of their Super Powers line, the New Teen Titans, and the Justice League of America. 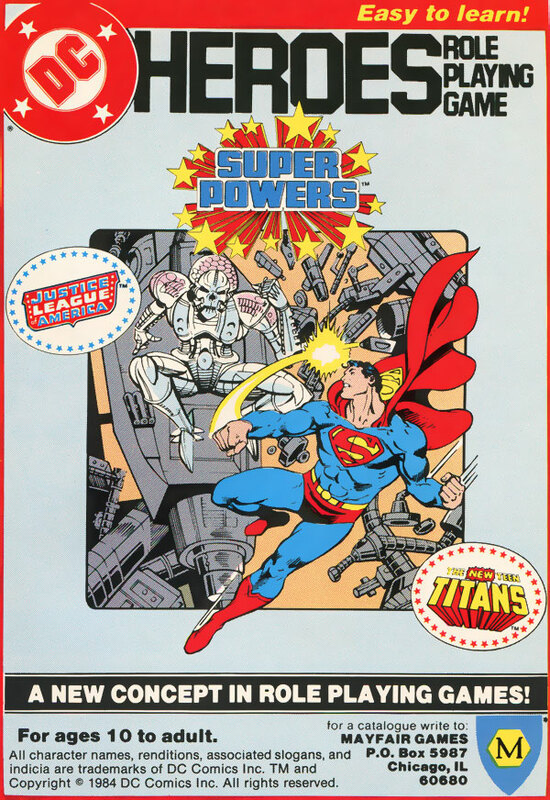 The first edition of Mayfair’s DC Heroes came out in the summer of 1985. For me it was love at first sight! A gorgeous George Perez cover! Stats on my favorite characters! A combat system based on both combatants skill level! I recall spending hours and hours role-playing Batman adventures with my good friend Ravenface. As the years went by I continued using the system. When the second edition came out in 1989, I became a full-time addict. I was part of a dedicated group of players by that point. We role-played our own adventures weekly, saving the world with a pair of ten-sided dice. Over the years I’ve picked up quite a few of the sourcebooks and modules. Click the image below to enlarge and see some of what I own. Beneath the image is a complete list of products I own from Mayfair’s DC Heroes Role-Playing Game. If you’ve ever role-played superhero games, then I’m sure you feel there was a “magical” system for you. One that sticks out in your memory as a fantastic game system. Mayfair is that system for me! It wasn’t the game mechanics that I loved, it was more about the products and accessories. Be sure to check back here during the Mayfairstivus holiday for more on the RPG! Also, the celebration continues at the following blogs! Be sure to visit them throughout Mayfairstivus. Finally, here are a few previously published Mayfair-related posts by friends worth checking out too! Be sure to come back tomorrow when we look at the three different editions of the game! This was the first superhero system that made sense to me. The exponential scale is still the best way I’ve seen for having Superman and Jimmy Olsen in the same universe without having seven-digit stats. Still, it had a few peculiarities. I started playing in ’88 or so, so that means my gadgeteer character has been stuck in his basement trying to make a fish fork for 22 years now. This is an excellent look back! Look forward to travelling down memory lane. I must admit that the Mayfair game was not my favorite superhero game (sorry) but the books and the supplements were awesome and such a great read. I’m actually working on a review of the newer DC Adventures RPG (and a month late harebrained idea of a virtual book club at the Stargazer’s World blog) and was looking for an expert on the Mayfair game to do a retrospective, so I will link back to this when I finally write the post. Good Lord! You went mad with those links! I was especially impressed with Siskoid’s extensive stat library, which I wasn’t aware of. I’ve never seen the ’85 box up close, but I was really impressed with the ’89 box’s elegant spot varnish.